LEXINGTON, Ky. (March 15, 2019) – There's something about March Madness — the brackets, the competition, the anguish and the elation. During this magical month when the hype is heightened, it's undeniably apparent — college basketball is more than just a game. 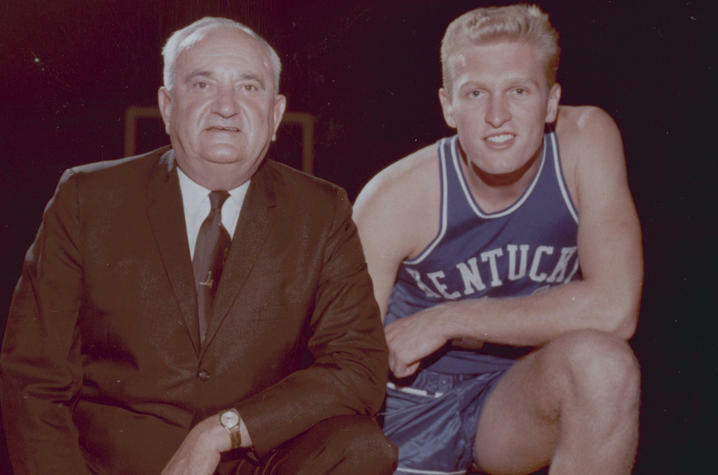 If you’re a University of Kentucky basketball fan, you probably recognize the name Nash. Charles “Cotton” Nash is known as one of the greatest college basketball players of all time. 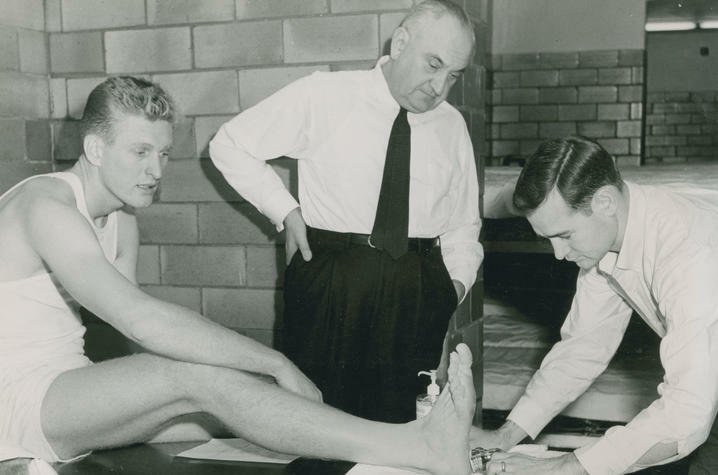 In fact, he played basketball and baseball at UK from 1961 to 1964. His jersey, number 44, hangs in the rafters of Rupp Arena. UK was just the first of many chapters for Nash. “Cotton” went on to play for the Kentucky Colonels and the Los Angeles Lakers – he also played professional baseball. “Cotton’s” legacy is storied and known, and his impact on Kentucky and the Commonwealth lives on with his grandsons, Casey a medical student in the UK College of Medicine and Nick Nash, a second-year student in the UK College of Law. Cotton was as dogged on the court, as Casey and Nick are off the court. In undergrad, Casey studied Science Business at Notre Dame University. He always wanted to enter a field in which he could apply his love for science and his passion for helping others. He returned home to Lexington for medical school and will graduate in 2021 with plans to pursue a career in internal or emergency medicine. Nick went to Boston for his undergraduate studies, but longed for the city he calls home. "My entire family is here, and Lexington is a really special place for a lot of reasons," he said. "Picking UK for law school was a no-brainer. They have such a great reputation in the area for a good reason: great professors who prepare students really well for legal practice." Nick plans to practice in Lexington after graduating in 2020. The Nashes are a family of athletes. Nick, Casey and their siblings play a variety of sports including baseball, basketball, football and track. Being in a family that not only enjoys playing sports — but watching them — Casey and his family members have always been UK fans, and their unwavering pride stems from a long-standing tradition. “Cotton got us season football tickets and so every year we went to all the home football games and then we would rotate who got to go to the basketball games. Kentucky basketball and football has just meant the world to me my whole life, especially with Cotton there,” said Casey. While the Nashes are supporters and fans of UK, they are also supportive of each other. Casey and Nick have many fond memories of their grandfather helping teach, coach and attend sporting events throughout their childhood. “He would come to every sports game that we played. He still does because I have little siblings and he would show up with his own lawn chair and just sit by the dugout or on the ground and just watch, even if we were on the bench and knew we weren’t going to play, he would still be there,” Casey said. With the experience of “Cotton” feeling pride for his grandchildren, Casey feels the same pride for his grandfather. “You go into Rupp and you see his jersey hanging in the rafters and we’ve always been super proud of that and I think has been a fuel and why I’ve been a huge UK fan my whole life and why I like Lexington and wanted to come back here for med school." These days, it’s harder for the legend to tackle the stairs in Rupp Arena, but that doesn’t stop him from enjoying the Cats, Nick said, "Cotton likes to watch games on his couch and smoke cigars. It’s fun to listen to him compare his era of college basketball to the current state of the game," Nick said. "Cotton was a great shooter and rebounder with an unstoppable hook shot. So, I think he sees himself in PJ [Washington]." Both Casey and Nick feel they owe a debt of gratitude to the institution that is the alma mater of their grandparents, parents and uncle. “I wouldn’t be here without Kentucky basketball, because Cotton got recruited to play here and he stayed here and met my grandma. If he had gone to another college, then I wouldn’t be around. I kind of contribute my life to Kentucky basketball in a way,” said Casey. Nick’s sentiments were similar, "He met my grandmother, a Kentucky native, here at UK. So, I like to tell people I owe my life to UK basketball." Juggling studies and March Madness can be a challenge, but with the right balance, Casey and Nick prioritize their studies and enjoy basketball post-season. “You have to build time in to do things that you enjoy, which includes watching basketball, so I try to get as much done as I can and if there’s a game on then I just stop what I’m doing, sit down and watch that, enjoy it, use it as a break and get back to it,” said Casey. "Kentuckians share a passion for basketball, no matter their differences. It brings people together," Nick said. "It’s really special to feel like our family is a part of that UK tradition." Decades ago, Cotton started a legacy. Today, the Nash brothers are continuing that legacy. Though they are individually successful, family not fame, seems to dominate their lives. That might be the most important thing their grandfather taught them.